St. Jerome's Church in East Dorset, Vermont. was coming down. Only 4 towns away, not very far! I would be able to see the frame. The weather was beautiful; I was itchy for a drive. Add to that my friend from the 2016 PTN Workshops, Lisa Force, was one of the crew. Of course I went. This is Lisa striking a pose in her haz-mat suit. The church was built in 1874 for the Catholic stone masons who had come to Dorset to work in the quarries and shops. By 2010 it had only 6 members and a large, lovingly cared for cemetery. The church was closed. Naturally the roof leaked; mold grew. Here is the church with asbestos siding: sweet, unexceptional. Able to be built of local lumber cut at local saw mills by local craftsmen, the design fit its pastoral country setting. A dog house shed for the bulkhead had covered a section of the original siding, leaving it unchanged. The battens which had covered the joints between the boards were still there. They were fat and curvy , creating strong shadows, beautifully following the lines of the windows. I admire how those craftsman 140 years ago reinforced the shape and rhythm of the windows as well as the verticality of the church. The interior had been renovated several times; the floor covering updated, the ceiling lowered at least three times, the walls painted, most of the stained glass replaced, the alter reconfigured. The iron tie rods may have been original - or not. They are visible on the right: the straight horizontal chords that run right through the curved trusses. Those trusses simply took off half way up the wall. No base.While they were in front of the posts of the bays and symmetrical around the windows they were built up, not solid timbers. Way up at the peak, in the gloom above all the framing for the drop ceilings, (and what we thought was the original ceiling) the trusses crossed. 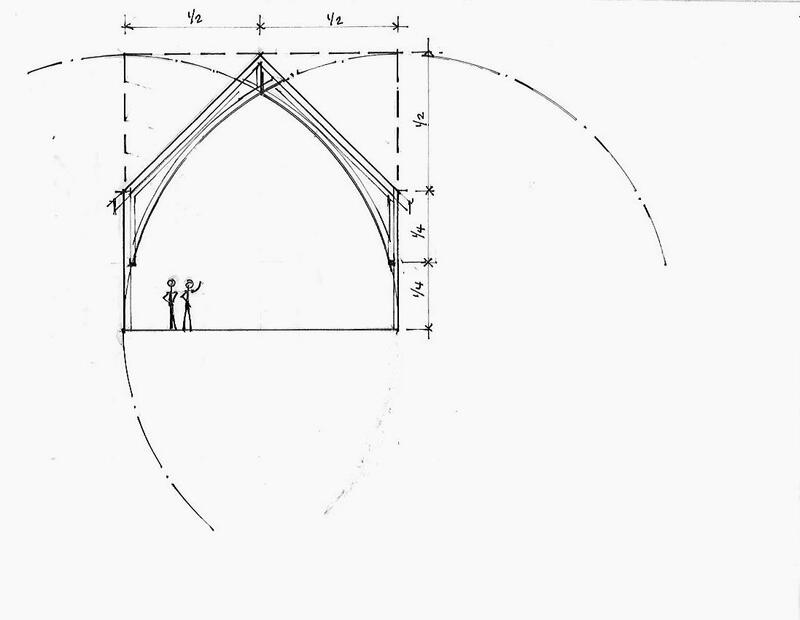 So I came home to draw a hypothetical church with curved trusses. Lisa critiqued (and I expect will continue to add her knowledge). This is how I think the church was laid out - a simple and elegant geometric design. That the designer understood how the frame could create the sense of the church became clear as the layers of interior improvements were stripped from the frame. The arches do cross. They are part of all the ribs of the bays from the narthex and the nave to the apse. They are an integral part of the frame. We saw that crossings were exposed, visible. They were carefully joined, their edges chamferred The trefoils and quatrefoils were inserts. The whole assembly was painted in subtle shades popular at the time: metallic gold on the trusses, brick on the tracery, and on the inside edge of the patterns: red! Perhaps the colors have faded; the emphasis has not. They were designed and carved to be seen. The carving, the tracery matched what we saw on the arches and inserts at the transition from the wall to the roof which we had photographed and discussed. But we had not know what we were seeing. The parts: the strength of the arches,the delicacy of the tracery, and the shapes they created were invisible when they were painted white. They had lost their grace, their power. The church is now stripped to the frame. It will be taken down completely in the spring of 2017. I have not seen a geometric layout like this before. 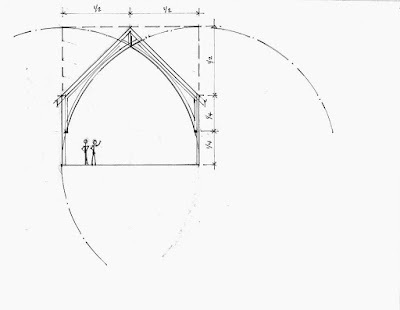 I will make measured drawings; then I look at the frame more carefully. I own drafting tools from this period. They are drawing instruments, 2 compasses and a divider as well as pens and 2 scales, made for drawing with ink. 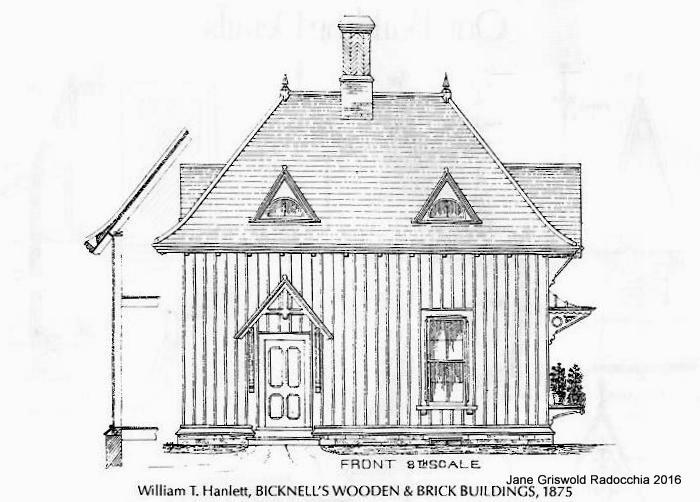 Were carpenter using compasses for layout and design in the 1870's? Time to explore post Civil War Victorian carpenter's tool boxes! Country Patterns 1843 - 1883, edited by Donald J. Berg, Revised 2nd edition, The Main Street Press, Pittstown, NJ, 1986. Thank you so much for this lovely article. This church was well loved & had at least a dozen families attending when it closed down. It is sad to see it be torn down, instead of being preserved as a community space. The one blessing is that we can finally see the beautiful architectural elements you describe, which were hidden to all of us by the drop ceiling. Lovely that the church still stands in this elemental fashion for a few more months. Thank you for stopping here to read and for adding your comments. I am sorry the building did not find another use, but that would have to happen years ago. With all its layers of updating and modernizing already there its original grace probably would have stayed hidden under a newer layer of paint, flooring and ceiling. By the time church was dismantled, the roof leaked and mold had taken over, so much so that it looked like snow, except it was upside down. Of course those beams could not be saved. Buildings need to stay dry in order to survive. I will post more after I have measured the church in early spring. I am especially glad to know that the church was loved by you, the last parishioners. I am an architect. I have always been attuned to space. When I went in the first time, the walls were stripped to the lath, most of the pews gone. the white mold thick. I could see that there had been some grace, but the sense of abandonment was stronger. The arches seemed a sad failed attempt, a poor copy. The apse, 2 steps up, arched half dome and doors, felt out of place. I felt the grace come as the ceilings came down. The space became holy. I have worshiped in many places that were not churches, and helped make them holy. Here I was not needed, the church itself spoke. My father is buried very close to the church. My family and I visit his grave several times a year. We were shocked and surprised to see the church torn down to its studs. We did not hear or see any materials indicating this would be happening. It is such a beautiful little church, is there no way to restore (at this point, reconstruct) it? I think the plan is to extend the cemetery into the the space occupied by the church's foundation which will allow more people to be buried there. I assume the Catholic Diocese in Burlington made the decision. I talked to the Dorset Town Clerk about the church She was a parishioner. You might speak to her. The company that deconstructed the building had a contract to take it down. They sold the parts to many different people. I think it would be very difficult to put it back together. The mold and decay was considerable. There were not enough people left to love it every day. My family is so heartbroken to see this. We live in NY now but our grandparents, great, great great are buried here. My baby brother and baby niece are also laid to rest in the little slice of heaven on earth. It was never a sad occasion to visit, it was pure peace and a deeply moving place to visit. You can imagine our horror as we made the trip just to see the foundation of what once was lying in ruins. Just heartbreaking. I’m glad you are pumped up by the architecture but some do not share in the enthusiasm, it is a desecration of holy land. What a shame!! !